Sized just right for little ones, this Sesame Street Slumber Set with Bonus pillow and eye mask will be the center of attention at the next sleepover. Your child can take their bedtime adventure anywhere. The side zipper of this sleepover bag makes getting in and out easy. 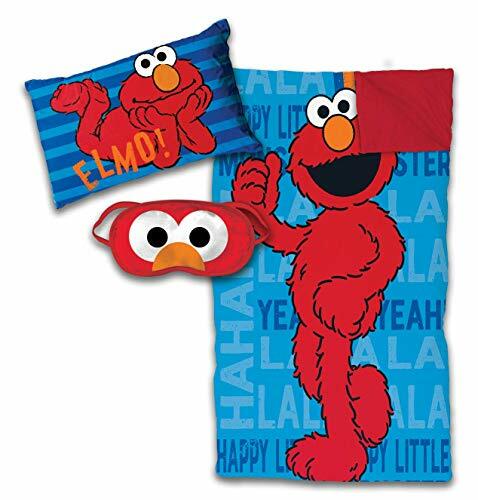 This Sesame Street 3 piece slumber set is great for sleepovers, watching TV, naptime and much more. Slumber bag features the beloved Elmo. 3 Piece set includes (1) slumber bag that is soft to the touch, (1) plush pillow and (1) eye mask. Slumber bag measures: 27" x 54" Pillow measures: 11" x 17". Makes a great gift. For indoor use only. 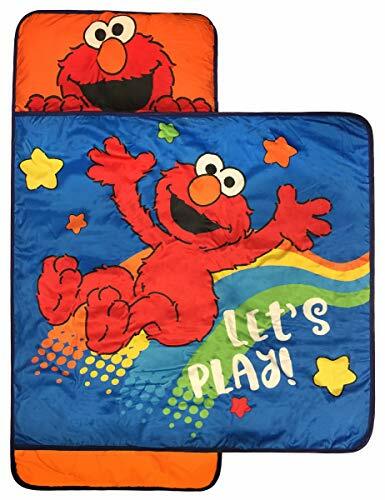 Make nap time fun with this Sesame Street Let's Play nap mat. Complete with a built-in, attached blanket cover and filled pillow, this nap mat is an all-in-one cozy and comfy nap time solution at home or on the go. Great for ages 3-7, nap mat measures 20" x 46", built in blanket 34" x 35" and, pillow 9.5" x 20". Attached blanket is designed for optimal coverage. Includes easy to secure Velcro closure and a carry handle for convenient travel. Easy care, machine washable. Perfect for daycare or preschool this nap mat's bold and colorful design will take nap time to another level. 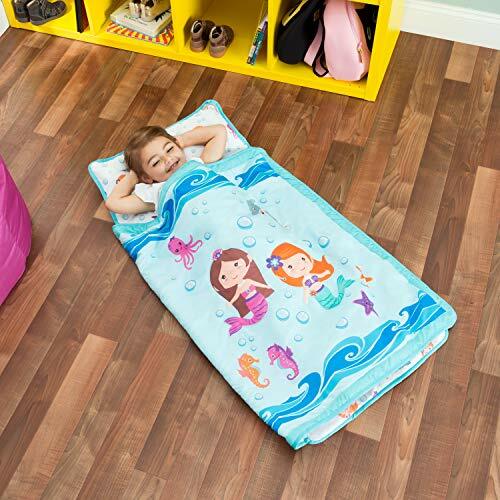 Simply un-roll this easy-to-use sleeping bag style nap mat and your child is ready for some quiet time. No zipper included for easy and safe use. Personalize your child's nap mat by writing their name on the name plaque using a waterproof marker and say Goodbye to nap time mix ups! For indoor use only, this nap mat can be used on a bed, on the floor or on a small cot. The perfect gift for holiday, birthday or simply to make preschool fun. 100% polyester shell and fill. Sized just right for little ones, this Disney Minnie Mouse Slumber Bag will be the center of attention at the next sleepover. Your child can take bedtime adventure almost anywhere with its convenient carry bag. The side zipper of this sleepover bag makes getting in and out easy. 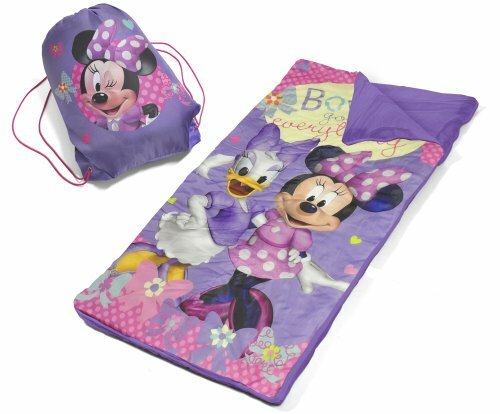 This Disney Minnie Mouse Slumber Bag is great for sleepovers, watching TV, Grandma's house and much more. 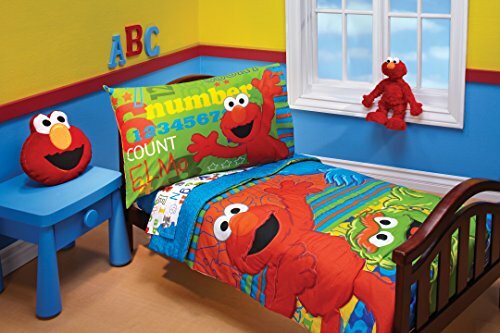 Sesame street abc 123 collections will keep your little ones warm and snuggly with this fun toddler bedding set. You'll be able to transform their room into a learning experience. They can help elmo with his abc's and 123's. This 4 piece bedding set includes a comforter, fitted sheet, flat top sheet and pillow case. 100% polyester microfiber. Machine wash separately in cold water, gentle cycle, using only non-chlorine bleach when needed; tumble dry on low heat; iron on low heat when needed. Are you tired of your children monkeying around when it comes to bed time? Leave the monkey business to their sleeping bag that will keep them toasty warm and super cozy all night long. 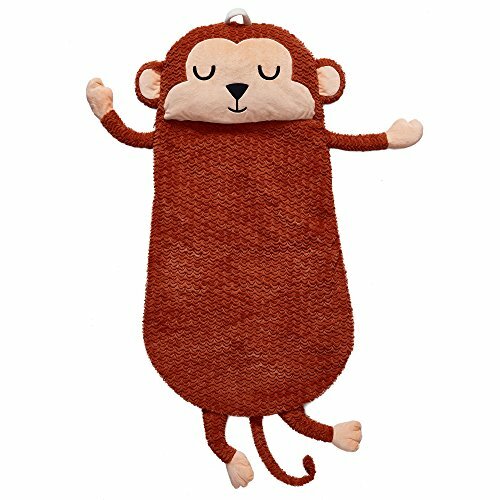 Sleeping bag features a super soft monkey that your kids will love slipping into at the end of the day or during nap time. Head of sleeping bag features a monkey face that can be used as a pillow. Arms are also attached so when children need that extra love and affection they can have a hug from their new best friend. What a great way to combine a security blanket and a stuffed animal into one! Sleepovers and campouts will never be the same again with this unique and fun design. Perfect for the little monkey in your life. GUND has teamed up with Sesame Street to make playtime a more huggable experience! Everyone loves Elmo, and this plush Take Along version of the popular character features long limbs that are perfect for on-the-go adventures. 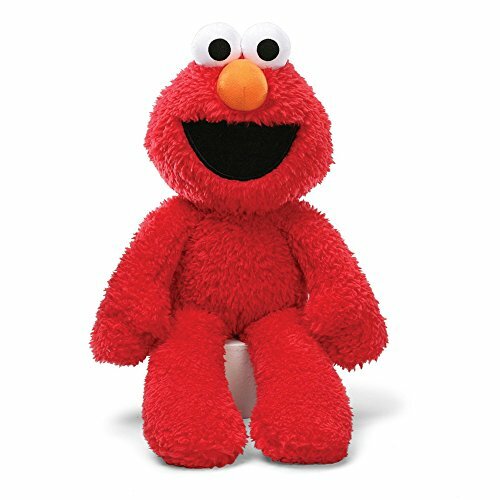 Soft red plush and accurate Elmo details are sure to please Sesame Street fans of all ages. As always, high-quality and huggable soft plush ensures that GUND products remain loyal pals for years to come. Surface-washable. Appropriate for ages one and up. About GUND: For more than 100 years, GUND has been a premier plush company recognized worldwide for quality innovative products. Building upon our award-winning and beloved plush designs, we continue to practice innovation by constantly developing new original and licensed designs to appeal to the next generation of customers. To that end, each one of our plush toys is constructed from premium materials for unparalleled softness and huggability. Stay warm and comfortable on your next outdoor adventure with the Coleman Brazos 30-Degree Sleeping Bag. It is an excellent choice for staying protected on those cold weather camping trips or emergency situations. The bag is lined with Tricot and features Coletherm insulation to ensure it can handle a temperature of 40 to 20 degrees Fahrenheit with ease. It is 75" long and 33" wide in order to accommodate people of all different sizes. The camping sleeping bag can also be rolled up for convenient carry and simple storage. It is equipped with a polyester cover to ensure that the insulation doesn't shift during use. Add this Coleman sleeping bag to your camping gear or survival kit so you can stay warm and cozy in a variety of conditions. It is extremely durable and designed to withstand the elements during outdoor use. The sleeping bag also makes an excellent gift for those outdoor enthusiasts in your life. The Coleman Biscayne Warm Weather Sleeping Bag is great for warm-weather camping. It is made for big and tall sizes, measuring 39 inches wide by 81 inches long and fitting most people up to 6-feet, 4 inches tall. The Biscayne is durably constructed of a polyester cover over a soft tricot liner, with four pounds of ThermoTech insulation to keep you comfortable down to 40 - 60 degrees Fahrenheit. This sleeping bag features the QuickCord storage system for easy storage — no tying required. ComfortSmart technology means your sleeping bag is packed with features to keep you warm and comfortable. The Coleman Youth Sleeping Bag has a camouflage design, a durable polyester cover and liner, a patented durable no-snag zipper and much more. Equipped with 2 lb Thermotech warm weather insulation, it will keep a person warm down to 45 degrees. This rectangle sleeping bag is quick and easy to put away as it comes with a simple stuff sack. A comfort cuff that surrounds the upper portion of the bag makes it more comfortable on the face. A no-snag zipper allows the bag to be opened and closed smoothly, each and every time. 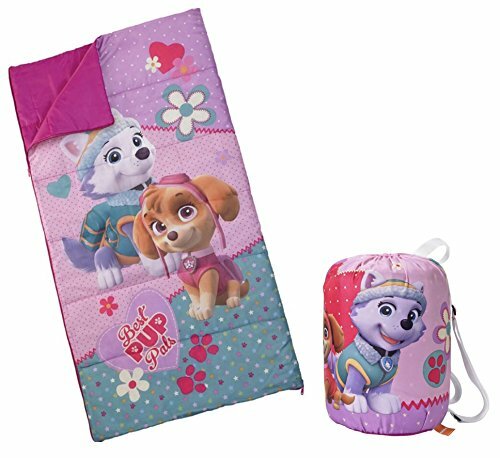 This Disney Frozen Kids' Sleeping Bag offers plenty of fun and style. It has a polyester outer shell and liner for exceptional comfort. Triloft II Performance insulation is used to provide added warmth. The item is equipped with a full-length, self-repairing zipper for ease of use. It is temperature rated for up to 45 degrees. This colorful camping sleeping bag is recommended for kids ages 4 and up. It measures 28" x 56" in size, making it the right fit for your little one. It comes in a reusable, non-woven, zippered cylinder that is convenient for storage and transport. The fill weight is 2 lbs. The Coleman Oak Point big and tall cool weather sleeping bag is great for cool weather camping. The bag measures 39 inches by 81 inches and fits most body types up to 6-foot, four inches tall. It is a big and tall sleeping bag, with four pounds of Coletherm Insulation. Coleman's ComfortSmart technology means your sleeping bag is packed with features to keep you warm and comfortable. The Coleman Big Game Sleeping Bag has six pounds of Coletherm insulation, a 10-ounce cotton canvas cover and cozy cotton flannel liner. This Coleman sleeping bag keeps you comfortable to temperatures of minus 5 degrees. The super king size fits most up to 6'5" and includes a 12" x 20" cotton flannel pillow. Otis gets an Elmo sleeping bag from Papa and Nanny, and the girls show off their newly painted nails.